Thomas J. Wible has been a concerto soloist throughout the United States and Europe, including appearances at the Gewandhaus in Leipzig, Germany; Dvorak Hall in Prague, Czech Republic; Franz Liszt Hall in Budapest, Hungary; Heinz Hall in Pittsburgh, PA; and the Maurice Guzman Concert Hall in Miami, FL. He gave his Carnegie Weill Recital Hall debut in October of 2011. Recent awards include First Prize Atlanta Flute Club Young Artist Competition, First Prize Alexander and Buono International Flute Competition, First Prize Longy School of Music Concerto Competition, First Prize Music Teacher’s National Association Woodwind Competition, Second Prize New York Flute Club Competition, Second Prize National Flute Association Piccolo Artist Competition, Semi-finalist in the Concert Artist Guild International Competition, and winner of the Pittsburgh Concert Society’s Major Artist Competition. As First Prize winner of the 33rd Annual James Pappoutsakis Memorial Flute Competition, he was presented in a solo recital at Boston’s Jordan Hall. As a recitalist, Mr. Wible has presented solo concerts at the Yamaha Piano Salon, Carnegie Mellon University’s Kresge Auditorium, the Boston Public Library’s Rabb Auditorium, Merkin Hall at Kaufman Music Center, Memorial Church at Harvard University, Engelman Recital Hall at Baruch Performing Arts Center, and Seully Hall at the Boston Conservatory at Berklee. He has been a guest artist clinician at universities throughout the United States and has performed at the National Flute Association Conventions held in Nashville, TN; San Diego, CA; Las Vegas, NV; Pittsburgh, PA; and Anaheim, CA. Active as a chamber musician and orchestral player, Mr. Wible has performed at the Eastern Music Festival in Greensboro, NC and, in the summer of 2008, held a Teaching Assistant Fellowship at the Brevard Music Center in Brevard, NC. 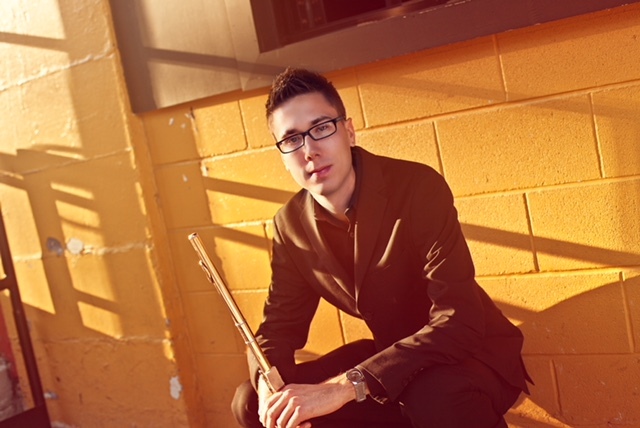 He recently completed a three-year position with The Orchestra Now (TON), a professional orchestral training academy in New York, performing regularly at Carnegie Hall, The Metropolitan Museum of Art, Alice Tully Hall, Jazz at Lincoln Center, Symphony Space, the Richard B. Fisher Center for the Performing Arts, and other venues across New York City. He can be heard on the Hyperion Records label, accompanying Australian pianist Piers Lane as Principal Flute of The Orchestra Now. Additionally, he has performed as a substitute flutist with the Boston Philharmonic Orchestra, Portland Symphony Orchestra, Atlantic Symphony Orchestra, New Bedford Symphony Orchestra, Discovery Ensemble Chamber Orchestra, and the New York Chamber Virtuosi. In the summer of 2018, Mr. Wible will travel to Grafanegg, Austria performing as a member of The Grafanegg Music Festival Academy Orchestra. Thomas is currently a first year doctoral student at the University of Maryland, where he studies with Dr. Sarah Frisof. He holds a Master of Music from the Longy School of Music of Bard College, Artist Diploma from Boston University’s College of Fine Arts, Graduate Performance Diploma from the Boston Conservatory at Berklee, and a Bachelor of Music from the New England Conservatory of Music. Oboist and optimist Lydia Consilvio is a first year doctoral student at the University of Maryland, where she studies with Mark Hill. Consilvio graduated with her Master’s degree from the Yale School of Music under Stephen Taylor. She served as the Marshal for the Master of Music candidates at Commencement, a reflection of her artistic and academic achievements while attending Yale. In 2016, Lydia was nominated to attend the Rubin Institute for Music Criticism, an all-paid trip to San Francisco where she where she wrote and workshopped performance reviews with esteemed music critics. Simultaneously, she and a team of four other Yale colleagues were awarded a $1,000 grant from the Yale Entrepreneurial Institute to launch their startup, an online community of musicians who could share and improve their practice methods through live stream. Earlier in the year, Consilvio recorded for Naxos as part of the Yale in New York series. Lydia was the grateful recipient of the 2017 Philip Francis Nelson Prize at Yale, which went to "a student whose musicianship is outstanding and who demonstrates curiosity, talent, and the entrepreneurial spirit in many dimensions of the music profession." Prior to Wavelength, Lydia was oboist of the Videnia Quintet at Yale. The ensemble spent their summer of 2016 at the Norfolk Chamber Music Festival and the Avaloch Farm Music Institute. They competed in the semifinals at the 2016 Fischoff Competition and were given the opportunity to present an hour-long recital on the Millenium Stage at the Kennedy Center in 2015. She looks forward to revisiting the stage with Wavelength Winds in November. Lydia spent the summer of 2017 as a resident artist at the Atlantic Music Festival. In 2016, she attended the Pacific Region International Summer Music Academy in British Columbia, where she performed a double-oboe concerto alongside the Vancouver Symphony’s Roger Cole. Consilvio completed her Bachelor’s degree as a Rogers Scholar at the Eastman School of Music. At Eastman, she studied with Richard Killmer and received an Arts Leadership Certificate, graduating with high distinction in 2015. Her arts leadership work included an internship with Cordancia Chamber Orchestra, for which she was interviewed by National Public Radio. A seasoned Boston-area freelancer, Lydia has also played with the Rochester Chamber Orchestra, the Connecticut Virtuosi Chamber Orchestra, and looks forward to exploring the musical scene in Washington, D.C. with her recently acquired vintage English horn and upcoming rosewood oboe, both hand-crafted by Laubin. In October, she will be competing in the semifinals of the Concert Artists Guild Victor Elmaleh Competition in New York. Consilvio’s positive attitude and creative outlook make her an unconventional musician and an easygoing collaborator in both large and small ensembles, and across musical genres. Her instructing style is equally spirited, open-minded, and accessible. In addition to performing and teaching, Consilvio enjoys singing, songwriting, and exploring the vast and unusual terrains for the oboe. Connect with Lydia at www.oboestudio.com. Natalie Groom is currently clarinetist of Wavelength Winds quintet and substitute clarinetist of the Annapolis Symphony and Huntington Symphony Orchestras. A freelance musician, business consultant, and Junior Board member of Washington Performing Arts, she is a doctoral student studying with Robert DiLutis at the University of Maryland. A recent concerto competition winner, she performed Louis Spohr’s Concerto No. 1 with the White Mountain Symphony Orchestra in 2017. Other solo appearances include Leonard Bernstein’s Prelude, Fugue, and Riffs and Duke Ellington’s Tiger Rag. 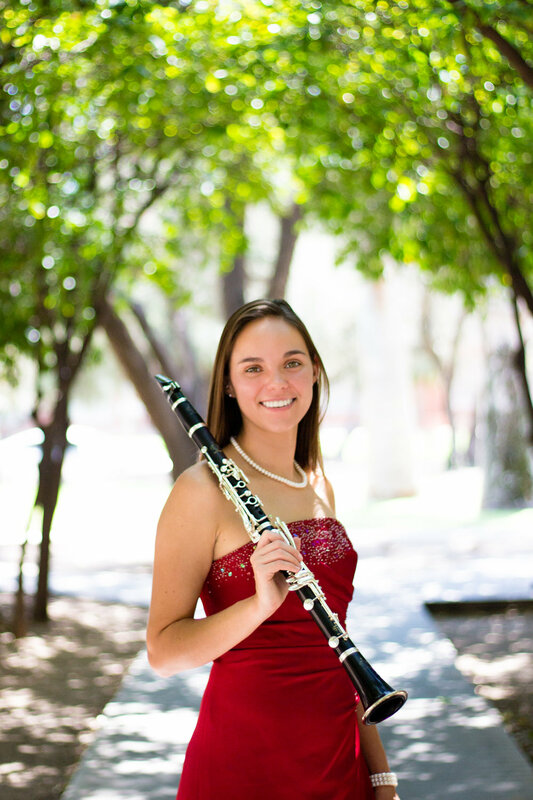 Specializing in wind quintet chamber music, Ms. Groom was clarinetist of the Fred Fox Wind Quintet (2013–2015), a group that was featured in a three-week tour of China across twelve cities and was integral in earning a $20 million endowment for the University of Arizona School of Music. FFWQ also competed in the MTNA Chamber Music Division National Finals and Plowman Chamber Competition Semi-Finals. She was ensemble manager that year. Ms. Groom has attended the Henri Selmer Clarinet Academy, Miami Music Festival, and Orford Centre d’Arts all on competitive scholarship as an orchestral, opera, and chamber musician. Additionally, she has performed in masterclasses with artists such as Philippe Berrod, David Krakauer, Fazil Say, and the Imani Winds and conducted clinics and masterclasses of her own. She is also a published contributor to the International Clarinet Association journal, The Clarinet. Ms. Groom earned her M.B.A. and M.M. from the University of Arizona and a B.M. and double minor in Jazz Studies and Entrepreneurship from Kent State University. She studied with Jerry Kirkbride, Dennis Nygren, Amitai Vardi, and Jackie Glazier. During this time she served as a substitute in the Tucson Symphony Orchestra and principal of numerous ensembles while teaching Business Communications, Rock and American Popular Music, Clarinet Studio, and Clarinet Choir. She has received many awards, grants, and scholarships including the UMD Quintet Fellowship, UA Quintet Fellowship, Outstanding Graduate Assistant Award, Lee T. Hanley Memorial Scholarship, Timothy Hay Clarinet Scholarship, Roy D. Metcalf Musicianship Award, second prize in the Intel Case Competition, and second prize in the KSU Business Concept Competition. A recent graduate of the Eller College of Management, Ms. Groom’s focus was on market research and data analytics. At her new home in Maryland, she looks forward to combining her passion for music and business in ways that enable the industry to thrive. Derek Maseloff earned his bachelors degree from Cornell University as a China and Asian-Pacific Studies Major (CAPS). In 2015, Derek was accepted into the Cornell in Washington program, where he studied privately with Abel Pereria of the National Symphony while interning at the Woodrow Wilson International Center for Scholars. Derek's research at the Wilson Center culminated in a joint publication with Dr. Marvin Ott in the East-West Center Asia-Pacific Bulletin. Derek's thesis at Cornell in Washington focused on the intersection of Western Classical music and diplomacy in the US-China relationship from 1987-1993. In Ithaca, Derek studied with Ilze Brink-Button and performed regularly with the Cornell Symphony, including a recent performance of Mahler's Sixth Symphony in Neuquen, Argentina. A lover of opera, Derek makes regular appearances with the Berks Opera Company in Reading, PA. This past summer, Derek participated in the inaugural concert tour of the National Youth Orchestra of China as a resident advisor, finally combining his passion for music with his Chinese language training. When he's not rehearsing or in the practice room, you can often find Derek cheering on his Philadelphia Eagles or cooking one of his signature tasty omelettes. He is thrilled to be a member of Wavelength Winds!